Exciting things are happening in our household at the moment. After almost a year of going backwards and forwards on house designs with our architect, a couple of weeks ago we finally submitted planning application for our house project. We have wanted to move for a while but couldn’t find anywhere we liked. Instead, we are completely re-modelling our home in to our forever home! It’s a huge project and instead of going mortgage-free this year which would have been a great achievement in itself, we’ll be re-mortgaging to fund it. I have been keeping my eye on interest rate news, as the rate at which we agree our re-mortgage will obviously affect how much the project is going to cost us. The chatter up until recently was that the next rate rise was predicted to be late summer, but it’s looking more likely to be earlier than that now. The consensus at the moment seems to be May 2018 for a rate rise. At the moment, I like to be able to quickly access real time information on the best deals out there so I know where to apply when we know for sure if we are going ahead with our project. I did start the re-mortgage process a little while ago but got so frustrated with having to schedule in lengthy phone calls and then the online document upload not working; I gave up. If I’m honest, whilst the house project is exciting, the whole re-mortgage process makes me want to switch off. It’s not user-friendly – I’m busy with the girls and I don’t have an hour to talk through a pre-approval application on the phone. It’s not something I can ignore any more though as we’ll soon need to lock in the finances. I want to be able to easily scan the full market and find the best mortgage deal for us. Without the hassle of these lengthy phone calls! Traditional mortgage brokers, whilst they would be able to provide advice on the best mortgage deal they can offer, often charge a fee and don’t always provide broad coverage of all the mortgage providers out there. So they are out. 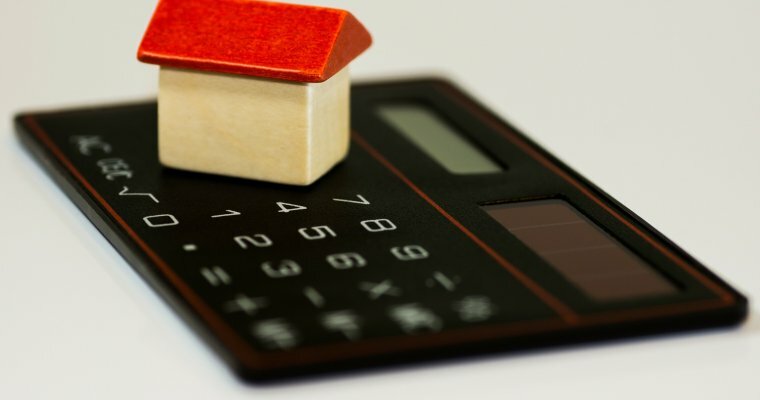 Price comparison websites are easy to use but similarly scan only a limited number of mortgage deals and they don’t provide any advice on which the best mortgage would be for us. So they are out too. Have a quick watch of this short video. Digital mortgage broker Nuvo offers a unique combination of financial expertise and intuitive technology. As far as coverage of the market goes, it offers real time product sourcing across a huge cross-section of the market: 30,000 mortgage products. It then recommends the best option based on your circumstances. And it’s entirely free to use! Nuvo is powered using artificial intelligence (AI) chatbot technology. I have been using AI chatbots linked in to my Facebook messenger for a while now; I save with Plum. I also use Chip to save via an app which uses AI. It’s so straightforward and beats having to have a real conversation with someone in a call centre any day of the week! The gifs can be a little overwhelming at times with some chat bots but thankfully Nuvo doesn’t use gifs. To get started, you just hit ‘Let’s Go’ on the Nuvo page. 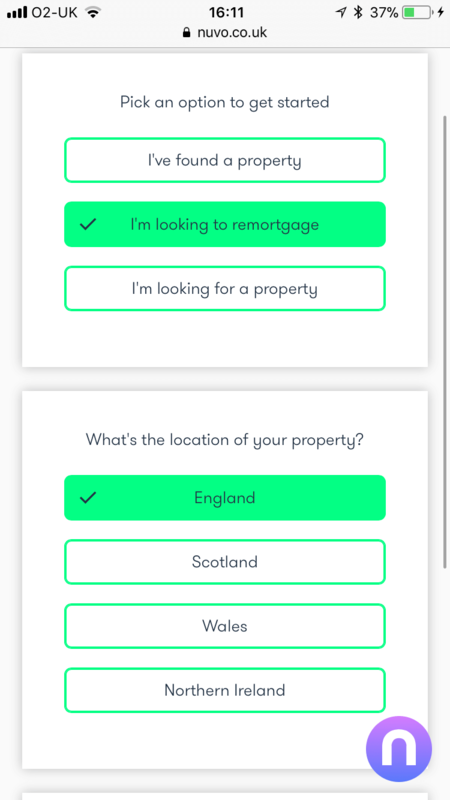 From there, you follow the prompts of the chatbot which start off by asking if you have a) found a property, b) are looking to re-mortgage or c) are looking for a property. The next questions are determined by your previous answers. You can have a full compare of the products available to you in LESS THAN A MINUTE, with results sorted by far more than price alone. I didn’t time how quickly my results came through but it was far quicker than this! 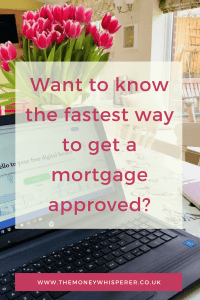 You can then go on to complete the full application in less than 15 minutes with real time product sourcing – so ‘live on the market mortgage deals’. What I like is that Nuvo not only recommends a product, but also gives you the chance to look at all products that you are eligible for too! Just so you know you are getting the best deal! Nuvo can provide an entire mortgage application fact find online in less than 15 minutes. Due to its third-party integrations, you can get a mortgage in principle at the end of this 15 minutes. 15 minutes start to finish! 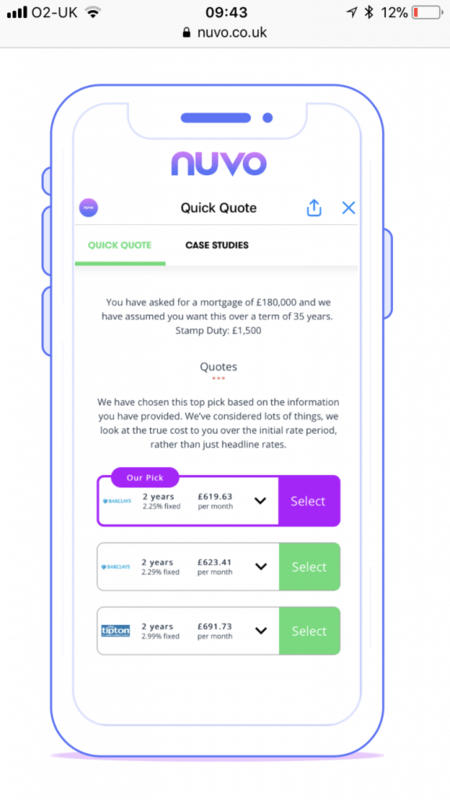 Nuvo has another release planned for late this month which will see an even more streamlined journey to getting a mortgage approved. Large sections of the fact find will be able to be pre-populated, allowing customers to get their mortgage in principle in a matter of minutes. Should be ready in time to coincide with our planning approval! I remember a re-mortgage we did a couple of years ago. I did some research on a comparison site myself and selected the mortgage provider that seemed best for us. I now know that through a broker there would have been hundreds more providers than I could possibly have found myself. Comparison sites do not do justice to the breadth of offers out there. Once I’d picked the provider, I filled in the initial data online, then was booked in for a call with an adviser for about 2 weeks out. A long, drawn out process and ultimately, I don’t know that I actually got the best deal at the end of it. Nuvo has access to more mortgage deals than all digital mortgage brokers; it can search through 30,000 deals. It’s safe to say that you can be confident that your requirements have really been put to the market. Concerned you are talking to a robot? Don’t be! I’m all for AI and advancing technology but I know that not everyone is entirely convinced yet. I’m calling on you to embrace it! AI makes the process more streamlined, that’s all. The AI chat bot is simply there to help you fill in the details required to flesh out which deal is best for you. Also, machine learning makes recommendations more accurate; there is no bias attached to any mortgage provider which you could find with human mortgage brokers. The technology is super clever but actually the key point here is that it’s just easier and quicker for you to get a mortgage approved. That said, financial products can be complex; we aren’t always confident in providing information and sometimes need to ask a question. Yes even us money bloggers! If you’re still not 100% convinced it will understand you, it’s worth reiterating that the technology allows a human element into the process. You can ask a question at any time through the chat bot. Chatbot technology enables this; AI is so clever! 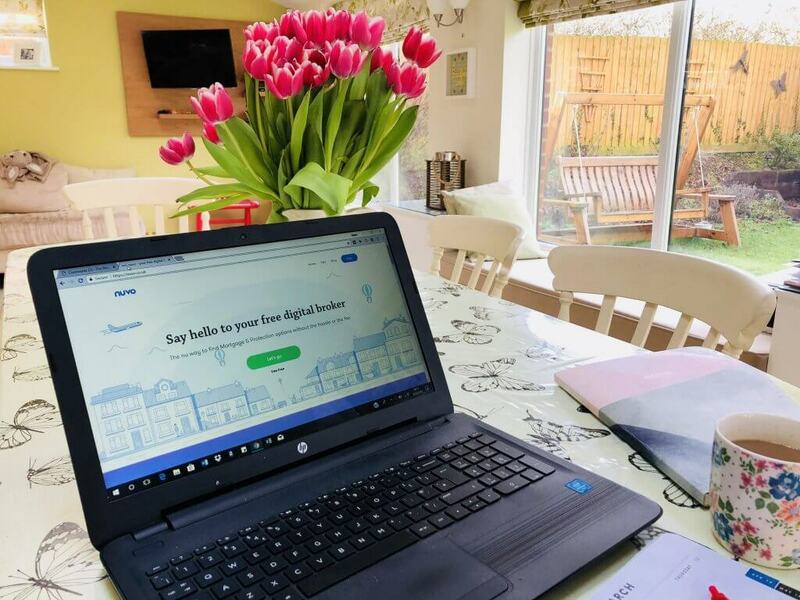 If at any time during the process you are unsure about anything, if you’d prefer to speak to a real human being in the form of a mortgage adviser then you can switch to live chat or pick up the phone to speak directly with them. Nuvo advisers are on hand to vet all the advice offered by the chatbot before you actually complete any purchase – so you have confidence that you have selected the right mortgage for you. Nuvo is constantly innovating to make sure it is offering its customers the very best. The full consumer launch will take place end of March. We should know about our planning approval by early April. Keep your fingers crossed for me. As soon as we know if it can definitely go ahead, I want to lock in our mortgage as fast as possible. I want to be a ‘Fast-Time Buyer’, especially as the rise rate is looming. Do you know what I am most excited about after the ease of using the chat bot? I’m looking forward to completing my mortgage application using electronic document uploads in Nuvo instead of having to make copies of payslips and send them in the snail mail. Big thumbs up! Why don’t you give Nuvo a whirl and let me know what you think. 1 Comment on Want to know the fastest way to get a mortgage approved? I love all of these online mortgage brokers, it makes changing your mortgage so much of a simpler job. Its possibly the job I least look forward to swapping every few years due to the amount of time it takes:-( But I still do it, money to be saved! !